“On their arrival in Capernaum, the collectors of the Temple tax came to Peter and asked him, “Doesn’t your teacher pay the Temple tax?” “Yes, he does,” Peter replied. Then he went into the house. “They tax the people they have conquered,” Peter replied. The name “Saint Peter’s Fish” comes from the above story in the Gospel of Matthew. Peter caught a fish that had a coin in its mouth, just as Jesus predicted, and paid the Temple tax with it. Although the passage does not name the type of fish Peter caught, it was very likely a Tilapia. Tilapia were one of the three main types of fish caught in Biblical times from the Sea of Galilee. Tilapia breeds easy and has a mild taste – not fishy. In factory fish farms today, they harvest large numbers of Tilapia which happily eats pellets made largely of corn and soy and gains weight rapidly. 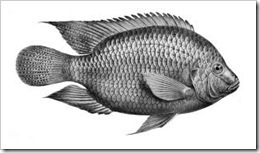 At the time the gospel events took place, Tilapia were called musht, or later called “St. Peter’s fish”. A common Bible story says Jesus fed the 5,000 people with five loaves and two fish, which scholars surmise were tilapia. Categories: Saint Peter's Fish | Tags: 000 Fed by Jesus, 5, Fish with Coin in Mouth, Matthew 17:24-27, Saint Peter’s Fish, Sea of Galilee Fish, Temple Tax | Permalink.